In a time when even airlines have scrapped free peanut service, a few righteous New York institutions are keeping their patrons in gratis bar snacks that are a far cry from stale Chex Mix. Almost makes the rising martini costs worth it. 10. Buffalo wings and nachos @ Rodeo Bar (Kips Bay) - Any place where the bar’s made out of a repurposed horse trailer knows the value of free. The kitschy hangout offers wings and nachos during happy hour, Monday through Saturday from 4 to 8 p.m., and Sunday from 6 to 9 p.m.
9. Truffled popcorn @ Desnuda (East Village) - The tiny ceviche bar has no kitchen, so the chef prepares seafood dishes right behind the bar. The view would be positively torturous without the bottomless paper cone of popcorn to nosh from, seasoned with just enough truffle salt. 8. Tater tots @ Trash (Williamsburg) - The Brooklyn dive is the sort of place that wouldn’t card you as a teenager -- so it’s only fitting that they offer the cafeteria classic. Who knew tots complimented two-dollar PBR so well? 7. Antipasti @ Il Mulino (Greenwich Village) - Leaves no customer unstuffed, starting with free helpings of antipasti circulated through the restaurant and bar areas. 6. Soft pretzels and roasted almonds @ Blaue Gans (Tribeca) - The cozy German restaurant boasts one of New York’s most perfect pretzels, served to bar patrons upon request along with buttery almonds that’ll make it tough to ever go back to beer nuts. 5. Pizza @ Alligator Lounge (Williamsburg) and Crocodile Lounge (East Village) - The bi-borough bars have made their respective presences known by offering a free personal pizza with every drink, making each a great place to start or end a casual night out. 4. Panini @ Vero Midtown (Midtown East) - Every Monday night, the wine bar serves its crispy, cheesy panini with every drink order. 3. Cheese spread @ Blind Tiger Ale House (West Village) - The after-work appeal of Blind Tiger skyrockets during Wednesday’s happy hour (starting at 5 p.m.), when free cheese from neighborhood institution Murray’s is offered to patrons. 2. 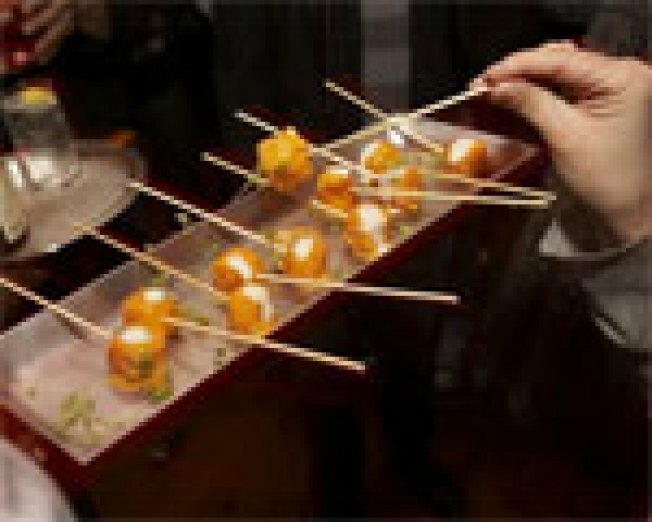 Free appetizers @ dell’anima (West Village) - From 4 to 6 p.m. on weekends, the acclaimed trattoria serves a variety of small Italian plates. 1. Curried popcorn @ Tailor (Soho): Serious drinkers swear by Tailor’s curry-dusted popcorn, which holds its own next to the mixologist-approved cocktail menu.